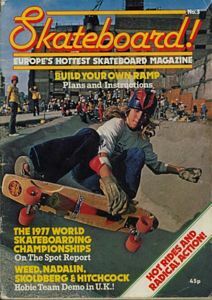 Britain's first Skateboard Magazine, Issue 1 came out in August 1977 but we had to wait till October for Issue 2. 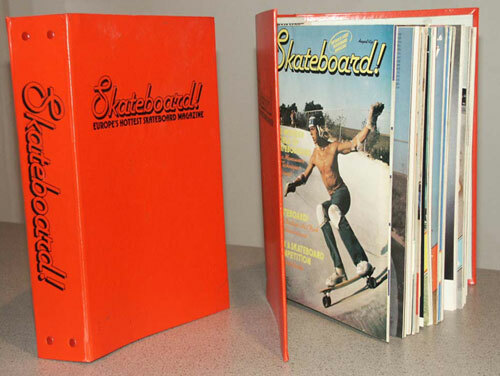 Edited by Bruce Sawford this monthly magazine ran for 19 issues. It featured the cream of British riders and documented the UK scene and UK Skate Parks as well as news and articles from the USA. Early Who's Hot included John Shayer, Si Napper, Marc Sinclair, Tim Levis, John Sablosky, Jules Gayton, Kadir Guirey, Danny Action Bond and Jeremy Henderson amongst others. Early issues had a lot of coverage of London's Skate City and Meanwhile Gardens - but as new parks and spots opened the magazine began covering more of the UK. At its height the magazine was a rather 'thick' affair with pages of advertising but as the second wave closed and advertisers dropped away, the magazine became noticeably 'skinny' in its last few issues. Perhaps one of the most memorable features of it were the legendary Alpine Sports adverts that went on for five or six pages, packed with photos of dream set ups and a page of wheels shown 'actual size'. I can still smell the urethane from those early Red Kryptonics. The magazine must have tried going quarterly in its final days as Issue 18 is February and Issue 19 is June - However Issue 19, June 1979, was to be the last. 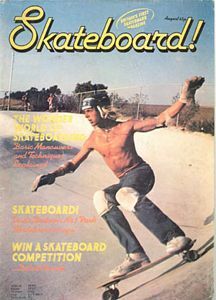 Steve Kane (a major force in the magazine and featured on a semi regular basis) would resurrect the title in the 1980's - Skateboard! (UK) 1988.